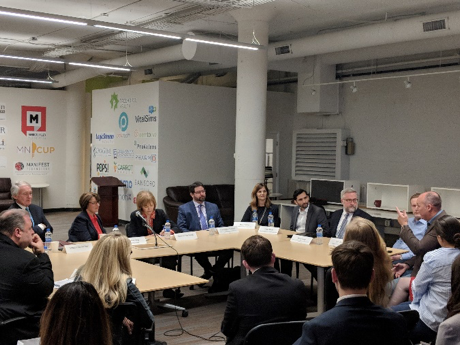 This past Friday, Senators Amy Klobuchar and Tina Smith hosted a roundtable at TreeHouse Health with Senator Ed Markey (Massachusetts) about Net Neutrality. 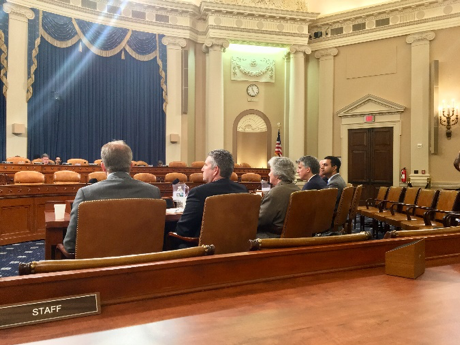 Nearly a dozen stakeholders – including Medical Alley Association members John Brownlee from vidscrip and Uziel Marte from Zipnosis – discussed the necessity of legislation to reinstate recently repealed rules on Net Neutrality. Thank you to Sens. 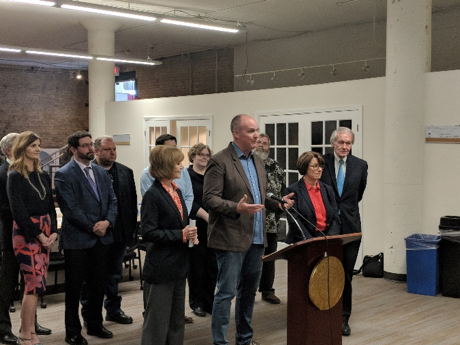 Klobuchar and Smith for holding a roundtable on this important issue and to Medical Alley Association member TreeHouse Health for hosting! Last Thursday, April 26, the U.S. House Ways & Means Health Subcommittee, of which Congressman Erik Paulsen is a member, held a hearing entitled “Identifying Innovative Practices and Technology in Health Care.” Several companies were invited to testify on how their innovations improve health care delivery for patients and what challenges they are facing. Zipnosis – represented by Dr. Rebecca Hafner-Fogarty – was one of these companies. Dr. Hafner-Fogarty shared how Zipnosis’ story and how their unique and innovative approach to health care is benefiting patients. Her full testimony can be found here. The Medical Alley Association’s 2018 Annual Meeting was held on April 24, 2018 at the Renaissance Hotel at the Depot in Minneapolis. More than 700 people from the Health Innovation and Care community attended to network, celebrate the momentous achievements of 2017, and look ahead to what’s in store for the future of Medical Alley. 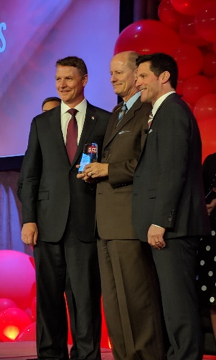 A highlight of the evening was the presentation of the 2018 Alley Awards, which recognize companies or individuals for their contribution to advancing Medical Alley as the Global Epicenter of Health Innovation and Care. One of this year’s winners was Senate Majority Leader Paul Gazelka. Sen. Gazelka is a long-time champion of policies promoting the health technology industry in Minnesota, including the Angel Investment Tax Credit. Thank you Sen. Gazelka for your support and congratulations! Yesterday – Monday, April 30 – the Minnesota House of Representatives passed their tax bill off the House floor. This bill significantly alters several parts of the Minnesota tax code. It modifies the Minnesota Individual Income Tax system by changing the starting point from Federal Taxable Income (FTI) to Federal Adjustable Gross Income (FAGI). It also increases the Minnesota Standard Deduction and keeps the personal exemptions eliminated under federal tax reform. The bill also reduces what is now the 3rd tier tax rate – currently 7.05% – to 6.75% beginning in 2020. Several changes are also made to the Minnesota Corporate Income Tax system. Deemed repatriation income brought back via the one time lower federal corporate tax rate is dealt with in two ways. First, the amount counted as income for Minnesota tax purposes is the same as was counted for federal tax purposes. Second, this income is treated as dividend income – meaning that it receives the Dividend Received Deduction (DRD). The corporate income tax rate is reduced from 9.8% to 9.06% beginning in 2020. All eyes now turn to the Senate, which is expected to pass its tax bill later this week. Although the bill will immediately be sent to conference committee, there is unlikely to be a final bill until near the end of session, which must happen by May 21. We will keep you up-to-date as the two tax bills progress. The Senate passed their 2018 Supplemental Budget bill on Thursday evening. Rather than passing individual budget bills, the Senate combined all the budget areas into one bill (similar to 2016 & 2014). There was no change to the items being tracked by Medical Alley Association, including the Step Therapy Protocol Override and creation of a special revenue account for the Spinal Cord Injury & Traumatic Brain Injury grant program (both of which were included). The House of Representatives, rather than passing one supplemental budget bill, is passing three, smaller bills broken up into several budget areas. One of these is HF3138 (Dean) which is the HHS and Transportation Finance bill. This bill is up on the House Floor tomorrow and, at this point, there are no changes to the provisions Medical Alley Association is supporting – including the Rare Diseases Advisory Council and Step Therapy Protocol Override. Despite the differing approaches, there is likely to be only one conference committee on the supplemental budget. We will be tracking this very closely and will keep you updated as it progresses. The Senate Finance committee is meeting on Tuesday to consider both SF730 (Rosen) and SF2897 (Utke). SF730 contains a new tax on every opioid sold in Minnesota and an increased registration fee on opioid manufacturers who sell in Minnesota. SF2897 is the Step Therapy Protocol Override language supported by Medical Alley Association and contained in both the Senate & House Supplemental budget bills. Each of these bills is expected to pass to the Senate Floor where they will be taken up shortly thereafter. Committees in both houses of Congress held hearings last week on ways to address the Opioid Epidemic. The Senate HELP committee – of which Sen. Tina Smith is a member – passed a bill that has several provisions clarifying how opioid alternatives are regulated. Language encouraging the development and use of alternative pain management – including medical devices – to reduce the number of opioids prescribed was also included. This bill awaits further action in the Senate Finance committee. The House Energy & Commerce subcommittee on Health advanced 56 bills designed to combat the opioid crisis. These included bills containing similar provisions to those passed by the Senate HELP committee and a new pain assessment as part of the ‘Welcome to Medicare’ process. The next stop for these bills is the Ways & Means committee. Final House & Senate passage of these bills is expected in early summer and we will keep you updated as they progress.